You know how I run things over here. Every now and then, I find an artist or group that catches my ear and has me genuinely intrigued about what makes them tick. 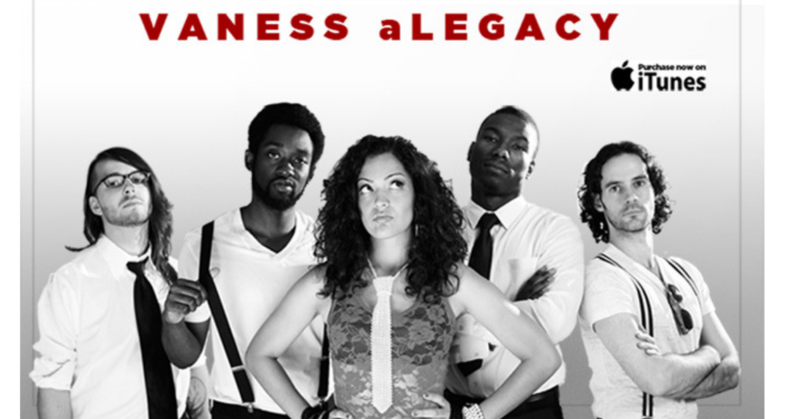 On my latest stumble, I found myself rocking with this rock/pop/R&B infusion group Vaness aLegacy. Yes, you read right. And you can hear it all in there as well. The band members are all steadily influenced by dancehall, pop, hip-hop and rock on the daily. You have to give it up to a group that decides to add a pinch of everything that influences them into their being. And, they do a great job of executing their vibe quite nicely. I absolutely love the tone in lead singer Vaness’ voice. It’s full-bodied, unforced. and totally flows freely. Vanessa is also a classically trained pianist, but handles the mic aggressively and leaves her mark. Yes, she can hang with the boys. There’s no doubt about it. Listening to her rock on “Ask And I’ll Stay” or my favourite recent find, their cover of Beyoncé’s “Countdown,” is enough to sing her praises to anyone who will listen. Hence, my write up. 🙂 She has just the right amount of deflection in her voice to keep the sugary R&B portion of the track at bay while letting a dry rock-cockiness drip from each lyric. I love it. The band also consists of Ricky on drums, Albert and Giordan on guitar and, Juwayon on bass. I met bassist Juwayon Clarke at an event I attended, and he was the one who actually put me on to the band. He was very chill as we shouted over the crazy booming speakers discussing the different musical avenues he has dabbled in. After asking around, I was told that he is a fantastic bassist, and has a rather impressive resume to boot. Being raised in a musical family has a lot of advantages, and those gifts that were imparted on Juwayon have not gone unnoticed. You didn’t think I was going to leave here without sharing Vaness aLegacy’s “Countdown” cover, did you? Press play to check it out below. This group is a tight-knit well oiled working machine. This is how Albert describes Vaness aLegacy’s sound: “…their sound is what you get if Rihanna and Pink had a baby, Haley Williams of the rock band Paramore babysat and the UK’s R&B/pop star Jessie J lived next door.” Sounds like my kind of melting pot. I’ve heard that their shows are something to experience. I have yet to do so, but I’m telling you now, that is now high on my “must do” list. And when I do, I will surely have a review coming your way.